Perfect for the urban jungle, MapSource MetroGuide North America v6 offers similar coverage as City Select, including detailed maps throughout the United States — and now full coverage of Canada and Puerto Rico and with verified coverage for Alaska. 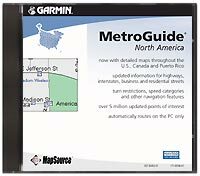 MetroGuide offers automatic route capability on the PC, and is compatible with Garmin units that do not have automatic route calculation themselves. Best of all, this product is fully unlocked! See the product compatibility table (below) for a list of products that Garmin recommends with this software. **These functions of this product work with nearly all Garmin GPS units, excluding the GPS 100 family and panel mount aviation units.